We were up early and on the bus to the next destination by 7:30am. 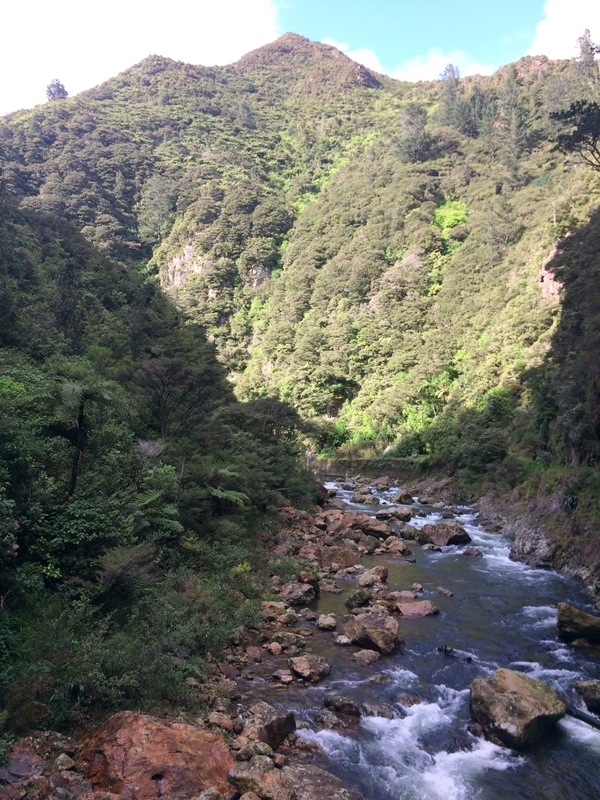 After a few hours nap on the bus, we stopped for a short walk at Karangahake Gorge. Luckily the rain was holding off for now and the scenes were beautiful! We got slightly lost and muddy on the way back to the bus but we made it in time for the last bit of the drive to Waitomo. 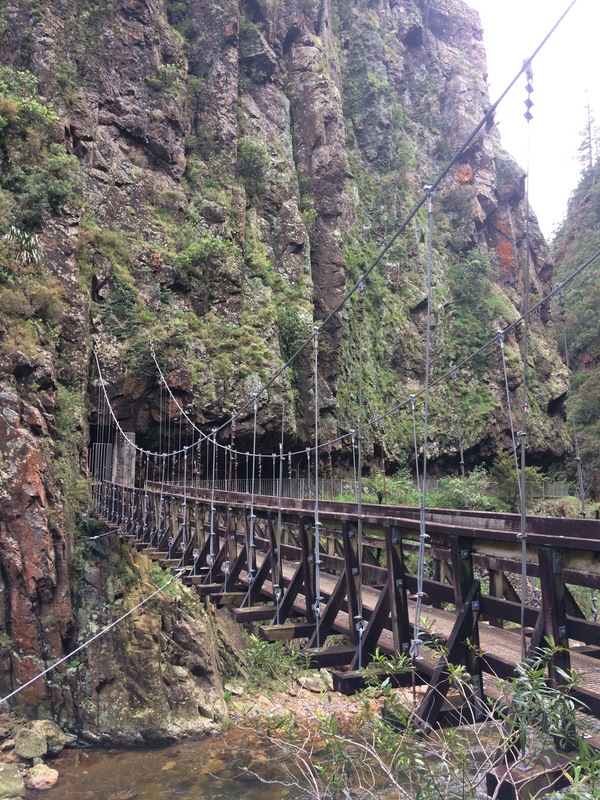 The sign on the bridge read ‘no more than ten people at a time’…. didn’t fill me with confidence! After a quick check in at the hostel, we were off for our fist big adventure activity with the black water rafting company. 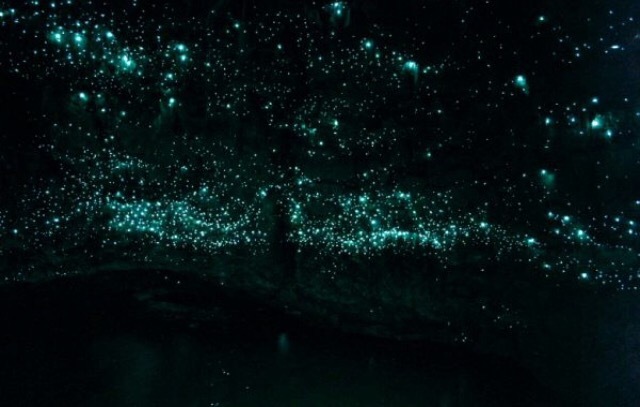 They offer lots of different trips through the famous local caves to see the glow worms. Steph and I being us opted for the most adventurous, most expensive trip they offer: The Abyss. 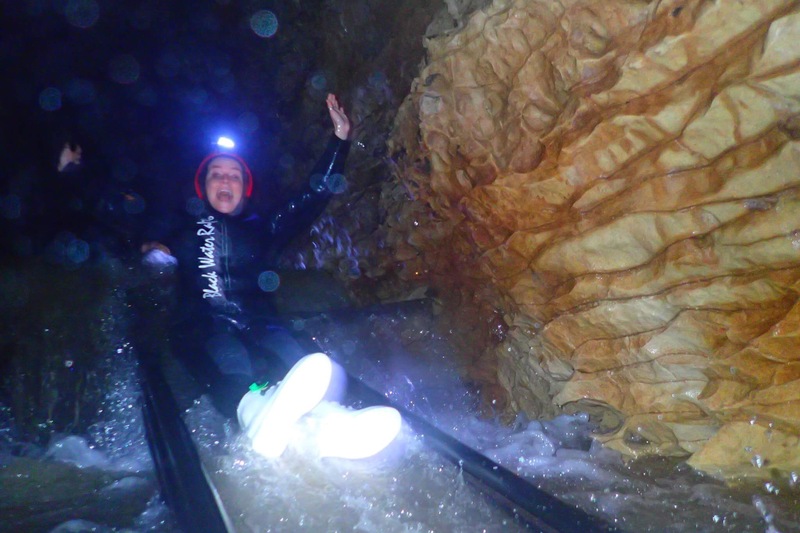 Being the massive wimp that I am and even in my mid twenties and still afraid of the dark, water and small spaces, five hours in cave was my idea of hell. I was pretty petrified! Along with three boys from our bus and three tour guides we donned all our kit and started the tour with a 35m abseil into the cave. 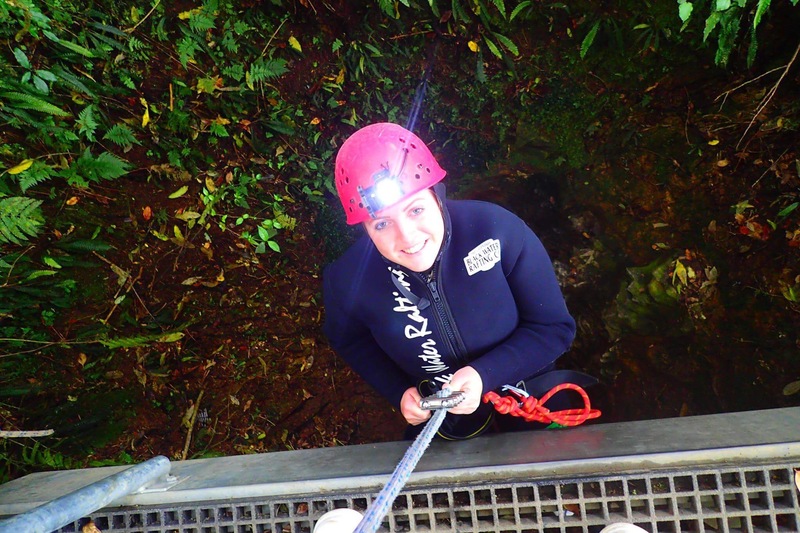 I’ve abseiled fairly recently so wasn’t too scared about this part, however half way down you have to go through a hole as big as your body into pitch black. For several minutes you are hanging in the pitch black, on your own wondering what on earth you’ve signed up for! Once we were all firmly within the cave we headed for the next part. I was attached to a zip line, all torches went off and I shot off under a ceiling of glow worms screaming like an 8 year old girl. The poor tour guides looked very confused as to why I was here! 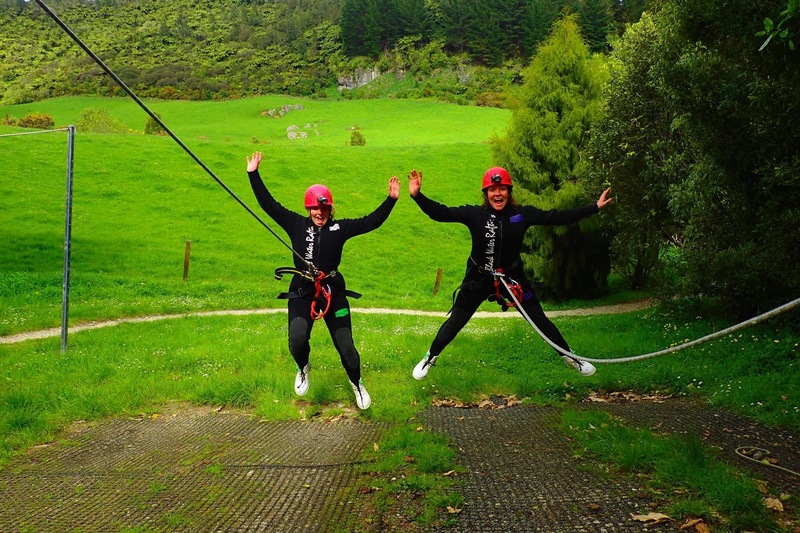 I was petrified at times, but travelling is all about overcoming fears! After a quick hot choccy break, we grabbed a rubber ring each and jumped a fair distance into the water below. I was very close to opting for the ladder at this point, but I didn’t want to be that girl! Not today anyway. Once in the freezing cold water we paddled along the water with our torches off admiring all the glow worms above. I don’t know whether it was the water or the welly boots, but it was so hard to swim! For most of the route there was rope to pull ourselves along but somehow I kept finding myself drifting from the group and having to speed my way back! Once we reached the end, Jack our main guide gave us a lesson on the glow worms (or maggots as we now know they really are). We sat in silence for several minutes admiring the beauty. Jack then announced the route back down the river was much easier as we all linked up and floated in the pure darkness. Being a cave, the acoustics were great and somehow I got roped into serenading the group! I was so nervous, but it felt truly magical singing in that environment and the glow worms are the best audience I will ever have. Jack also sang a Maori song to us (despite being a ginger English lad) and it was so good. One of the most surreal, incredible experiences, floating down a river below a curtain of twinkly glow worms while someone sings a beautiful song in a beautiful voice. So unlike anything I’d ever experienced! Shame we couldn’t take our gopro so I can share some footage with you! The guides took some photos for us but they were of poor quality and didn’t show the glow worms. Once back at the starting point where we jumped in, we ditched the tubes and took to the water by foot. It was so rocky underfoot and near impossible not to trip over a lot. One section of the walk is even nicknamed ‘the drunken stumble’. Whenever deep enough we would float on our backs but that did mean playing a bit of human bumper cars and take a rock to the bum every now and then! After a long while (almost too long as I was starting to get really cold and ready to leave the cave) we stopped for another tea break. 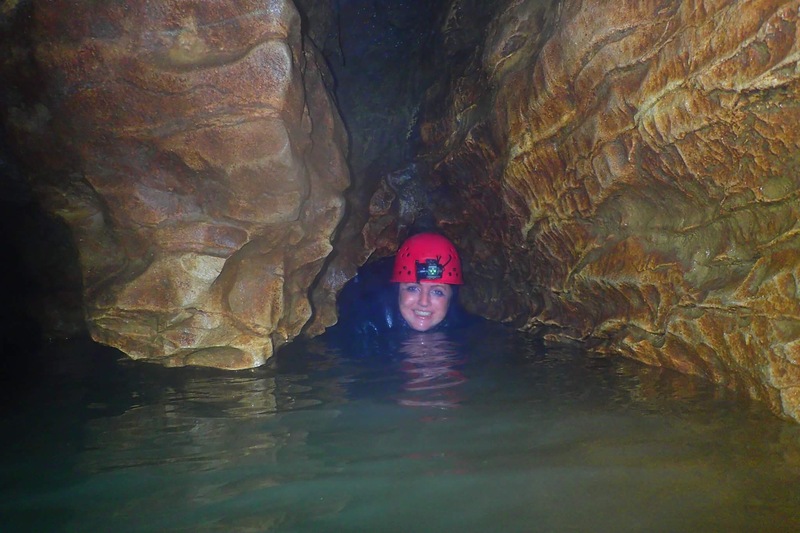 After a well deserved rest, it was on to the next sector, crawling through tiny caves! We took a few wrong turns but were finally free of all those horrible tight spaces where my claustrophobia was ready to completely punish me. At this point all we had to do was finish up and leave the cave after three hours underground. There were two options: the boring easy route or climbing up two waterfalls. They weren’t the tallest – maybe four metres each – but the water was incredibly powerful and we had no ropes and no harnesses. We just had our hands, feet, rock and most importantly some very experienced guides to help us and catch us if we fall. It was pretty scary, especially considering how clumsy Steph and I both are, but when your life pretty much depends on it, you hold on and climb for dear life! Finally I could see the light at the end of the tunnel to signify the end of our trip. We had such a good day thanks to the black water rafting company and I just hope I wasn’t the biggest wimp they’d seen that week! Very proud of myself for getting through it all without tears or a panic attack. Great little story. Really enjoyed it. Well done Robyn. Nice hat!! !